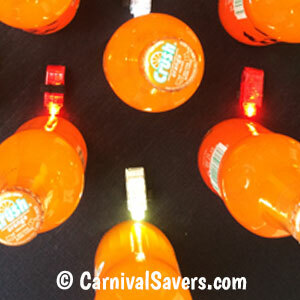 Halloween Game Fun - Glowing Tonic Toss Perfect for Teens! Halloween Game for Teens & Adults - Glowing Tonic Toss! Tape Bright Mini Flashlights to the Back To Glow. Fun Nighttime Game - Use Glow Bracelets as Rings! *We used orange, strawberry and cream soda for this game as the lights did not light up root-beer bottles as the liquid is too dark. 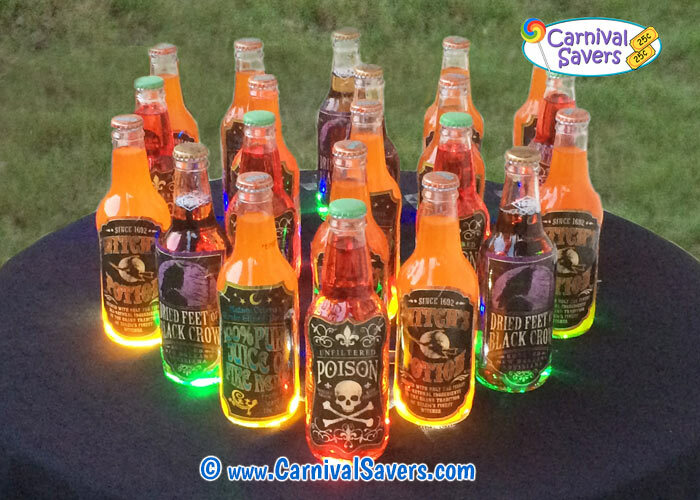 Also, we loved the way the blue and green mini lights would shine through the cream soda to give those soda a colorful and cool look! For an all adult Halloween Party, you could use light-colored wine coolers or beer bottles to accomplish the same look. Before your event, add a Halloween label to each cola bottle (even though the labels are sticky, we found that we needed clear tape to keep them from peeling off the glass bottles) Remember, these sodas are just for decoration, so they need to be room temperature to prevent the bottles from "sweating" and having your labels come off! A few hours before your party, set up as above with the soda bottles as shown above (be sure to keep some space for the tiny flashlights behind each soda bottle while keeping the bottles close together) See the image above. Tape a light to the back of each soda bottle or to most cola bottles. Note: we found the mini lights are brighter than flashlights and the different colors make this game fun! Players are given 5 Glow in the Dark Bracelets to see if they can ring a bottle to win a top prize. This game looks much easier than it is! Players can stand about 1 yard away from the game table, and skill is really not at play here as much as luck - so you will find this is great fun for teens or adults who do not have fantastic hand/eye coordination! 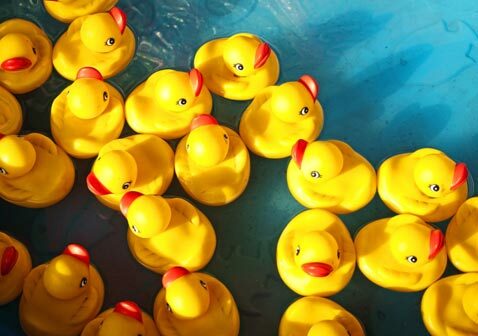 We have found that about 1 in about a dozen players should be able to win your top prize. 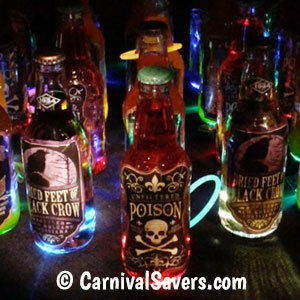 This game is perfect for older kids up to adults and especially fun as a Halloween game for teens as the soda bottle labels have "poison", "black crows feet", "witches potion" & more! Note: We suggest that you wait to turn on the mini finger flashlights until the party has started and you have folks ready to play this game! We found the lights seem to work for 2 or so hours and then will recharge somewhat if they have been turned off for a bit. If this is being used for a long Halloween evening event, you may wish to have two sets of lights to switch out as the first set becomes dim. SPOOKY SUPPLIES & PRIZES for the HALLOWEEN TONIC TOSS GAME!